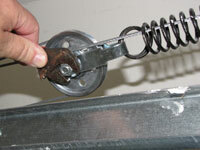 Adjusting garage door springs is only possible if the springs are not broken. If one or both springs are broken, you will need to replace them, no other choice, see 'replacing garage door springs' for information. Not sure if the springs are your problem? See the article 'Troubleshooting Overhead Garage Doors' for a complete listing of all the garage door topic. There are two types of springs on garage doors. Extension springs are the ones that run alongside the overhead door track and have a pulley and cable attached to them. Torsion springs are mounted over the door and a long round shaft goes through them, with a wheel for the cable on each end. Torsion springs are generally used for larger heavier doors, usually 10' or greater in width. Without the springs the door is very difficult to lift. At times the springs may do to good of a job and keep the door from closing all the way. When this happens adjusting is in order. The other situation would be if door is not closing level. It could be that one spring is putting more force on the door than the other. An adjustment could solve this problem. Read on to find out if adjusting garage door springs is something you want to tackle. Most of the time, this is a simple job for a service man. Unless something is broken, you won't need parts. A $50 to $75 service call would be the minimum. The serviceman may tell you that it is best to replace the springs a $150 to $200 job. An added danger is that the repairman may take the opportunity to try and sell you a new door. They can be quite convincing when telling you about poor quality and performance of your current door. A new door could run into the thousands of dollars. Do you really hate your current door? No, well then just fix it yourself or have it repaired. The difficulty level of adjusting garage door springs, varies with the type. Extension springs are easy to adjust. Torsion springs are dangerous and should only be attempted by those that have a good knowledge of how they work. Adjusting extension springs is fairly simple. There are different holes for the hook that holds the cable. The simplest fix would be to move the hook to a different hole. See Step One for instructions. Do not dismantle the spring, if you do not get it back together the door will not work. If you adjust the spring the wrong way the condition will be worse. Is the gap at the bottom of the door bigger after adjustment. Take two steps back. Adjusting garage door springs is a common repair. 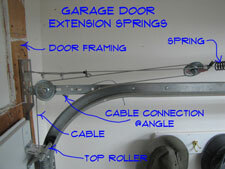 Garage door springs are used to offset the weight of the door. Without the springs the door is very difficult to lift. When garage doors won't close all of the way, or they close unevenly, spring adjustment may be called for. Extension springs are the ones that run just above the overhead track. They have cables threaded through them and a cable that is threaded around a pulley. This type does need to be adjusted at times. The next article discussed 'Adjusting Overhead Extension Springs'. This type of spring is used on smaller doors, usually eight or nine feet wide. Smaller doors are lighter and easier to deal with. It is not that difficult to adjust this type of spring. You can go over this topic again by following this link. The other kind is mounted on the wall above the door. There is a long round bar with pulleys on the end for the cables. This is a torsion spring. This type of spring can be dangerous, due to the fact that you have to work on it while it is under tension. You may want to hire someone to take care of this problem. However, understanding how they work is helpful when dealing with a serviceman. Do 'Garage Door Torsion Springs' get out of adjustment? Yes they do. The problem is that you have to work on them when the springs are in tension. The door has to be done and the springs are extremely dangerous when they are in this state. It is not recommended that the average person work on this type of spring. You can review the warnings and find out other resources by following this link. WARNING!! Torsion Springs can be VERY DANGEROUS, Precautions and thorough knowledge are REQUIRED!!! Do not attempt this repair without the proper skills. You are clear on the fact that 'Garage Door Spring Adjustments' are only advised for extension springs. We do not recommend adjusting torsion springs unless you have a thorough understanding of them and feel comfortable doing it. They can be dangerous. You should have been able to adjust your extension springs without too much trouble. Did it go well? Are you happy? Hopefully you found this information on adjusting garage door springs helpful.